"Kepler" redirects here. For the European cargo spacecraft, see Johannes Kepler ATV. For the space observatory, see Kepler space telescope. For other uses, see Kepler (disambiguation). Johannes Kepler (/ˈkɛplər/; German: [joˈhanəs ˈkɛplɐ, -nɛs -]; December 27, 1571 – November 15, 1630) was a German astronomer, mathematician, and astrologer. He is a key figure in the 17th-century scientific revolution, best known for his laws of planetary motion, and his books Astronomia nova, Harmonices Mundi, and Epitome Astronomiae Copernicanae. These works also provided one of the foundations for Newton's theory of universal gravitation. 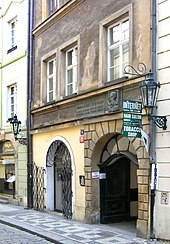 Kepler was a mathematics teacher at a seminary school in Graz, where he became an associate of Prince Hans Ulrich von Eggenberg. Later he became an assistant to the astronomer Tycho Brahe in Prague, and eventually the imperial mathematician to Emperor Rudolf II and his two successors Matthias and Ferdinand II. He also taught mathematics in Linz, and was an adviser to General Wallenstein. Additionally, he did fundamental work in the field of optics, invented an improved version of the refracting (or Keplerian) telescope, and was mentioned in the telescopic discoveries of his contemporary Galileo Galilei. He was a corresponding member of the Accademia dei Lincei in Rome. 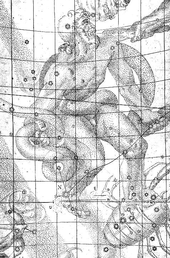 As a child, Kepler witnessed the Great Comet of 1577, which attracted the attention of astronomers across Europe. 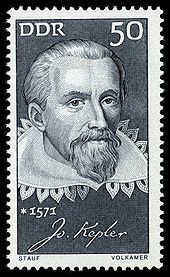 Kepler's first major astronomical work, Mysterium Cosmographicum (The Cosmographic Mystery, 1596), was the first published defense of the Copernican system. Kepler claimed to have had an epiphany on July 19, 1595, while teaching in Graz, demonstrating the periodic conjunction of Saturn and Jupiter in the zodiac: he realized that regular polygons bound one inscribed and one circumscribed circle at definite ratios, which, he reasoned, might be the geometrical basis of the universe. 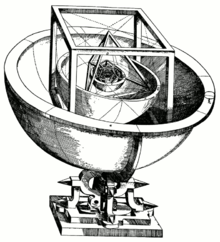 After failing to find a unique arrangement of polygons that fit known astronomical observations (even with extra planets added to the system), Kepler began experimenting with 3-dimensional polyhedra. He found that each of the five Platonic solids could be inscribed and circumscribed by spherical orbs; nesting these solids, each encased in a sphere, within one another would produce six layers, corresponding to the six known planets—Mercury, Venus, Earth, Mars, Jupiter, and Saturn. By ordering the solids selectively—octahedron, icosahedron, dodecahedron, tetrahedron, cube—Kepler found that the spheres could be placed at intervals corresponding to the relative sizes of each planet's path, assuming the planets circle the Sun. Kepler also found a formula relating the size of each planet's orb to the length of its orbital period: from inner to outer planets, the ratio of increase in orbital period is twice the difference in orb radius. However, Kepler later rejected this formula, because it was not precise enough. In terms of the impact of Mysterium, it can be seen as an important first step in modernizing the theory proposed by Nicolaus Copernicus in his "De revolutionibus orbium coelestium". Whilst Copernicus sought to advance a heliocentric system in this book, he resorted to Ptolemaic devices (viz., epicycles and eccentric circles) in order to explain the change in planets' orbital speed, and also continued to use as a point of reference the center of the Earth's orbit rather than that of the Sun "as an aid to calculation and in order not to confuse the reader by diverging too much from Ptolemy." Modern astronomy owes much to Mysterium Cosmographicum, despite flaws in its main thesis, "since it represents the first step in cleansing the Copernican system of the remnants of the Ptolemaic theory still clinging to it." In Kepler's religious view of the cosmos, the Sun (a symbol of God the Father) was the source of motive force in the Solar System. 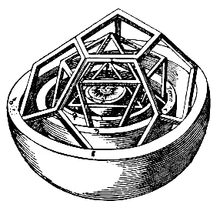 As a physical basis, Kepler drew by analogy on William Gilbert's theory of the magnetic soul of the Earth from De Magnete (1600) and on his own work on optics. Kepler supposed that the motive power (or motive species) radiated by the Sun weakens with distance, causing faster or slower motion as planets move closer or farther from it. [a] Perhaps this assumption entailed a mathematical relationship that would restore astronomical order. Based on measurements of the aphelion and perihelion of the Earth and Mars, he created a formula in which a planet's rate of motion is inversely proportional to its distance from the Sun. Verifying this relationship throughout the orbital cycle, however, required very extensive calculation; to simplify this task, by late 1602 Kepler reformulated the proportion in terms of geometry: planets sweep out equal areas in equal times—Kepler's second law of planetary motion. 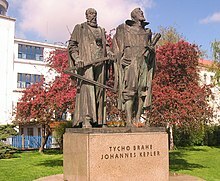 In Linz, Kepler's primary responsibilities (beyond completing the Rudolphine Tables) were teaching at the district school and providing astrological and astronomical services. In his first years there, he enjoyed financial security and religious freedom relative to his life in Prague—though he was excluded from Eucharist by his Lutheran church over his theological scruples. It was also during his time in Linz that Kepler had to deal with the accusation and ultimate verdict of witchcraft against his mother Katharina in the Protestant town of Leonberg. That blow, happening only a few years after Kepler's excommunication, is not seen as a coincidence but as a symptom of the full-fledged assault waged by the Lutherans against Kepler. Since completing the Astronomia nova, Kepler had intended to compose an astronomy textbook. In 1615, he completed the first of three volumes of Epitome astronomiae Copernicanae (Epitome of Copernican Astronomy); the first volume (books I–III) was printed in 1617, the second (book IV) in 1620, and the third (books V–VII) in 1621. Despite the title, which referred simply to heliocentrism, Kepler's textbook culminated in his own ellipse-based system. The Epitome became Kepler's most influential work. It contained all three laws of planetary motion and attempted to explain heavenly motions through physical causes. Though it explicitly extended the first two laws of planetary motion (applied to Mars in Astronomia nova) to all the planets as well as the Moon and the Medicean satellites of Jupiter,[b] it did not explain how elliptical orbits could be derived from observational data. Kepler was convinced "that the geometrical things have provided the Creator with the model for decorating the whole world". In Harmony, he attempted to explain the proportions of the natural world—particularly the astronomical and astrological aspects—in terms of music. [c] The central set of "harmonies" was the musica universalis or "music of the spheres", which had been studied by Pythagoras, Ptolemy and many others before Kepler; in fact, soon after publishing Harmonices Mundi, Kepler was embroiled in a priority dispute with Robert Fludd, who had recently published his own harmonic theory. In 1623, Kepler at last completed the Rudolphine Tables, which at the time was considered his major work. However, due to the publishing requirements of the emperor and negotiations with Tycho Brahe's heir, it would not be printed until 1627. In the meantime, religious tension – the root of the ongoing Thirty Years' War – once again put Kepler and his family in jeopardy. In 1625, agents of the Catholic Counter-Reformation placed most of Kepler's library under seal, and in 1626 the city of Linz was besieged. Kepler moved to Ulm, where he arranged for the printing of the Tables at his own expense. Epitome of Copernican Astronomy was read by astronomers throughout Europe, and following Kepler's death, it was the main vehicle for spreading Kepler's ideas. In the period 1630 – 1650, this book was the most widely used astronomy textbook, winning many converts to ellipse-based astronomy. However, few adopted his ideas on the physical basis for celestial motions. In the late 17th century, a number of physical astronomy theories drawing from Kepler's work—notably those of Giovanni Alfonso Borelli and Robert Hooke—began to incorporate attractive forces (though not the quasi-spiritual motive species postulated by Kepler) and the Cartesian concept of inertia. This culminated in Isaac Newton's Principia Mathematica (1687), in which Newton derived Kepler's laws of planetary motion from a force-based theory of universal gravitation. 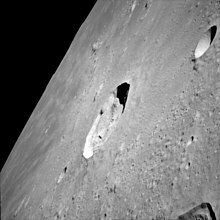 In astronomy: The lunar crater Kepler (Keplerus, named by Giovanni Riccioli, 1651), the asteroid 1134 Kepler (1929), Kepler (crater on Mars) (1973), Kepler Launch Site for model rockets (2001), the Kepler space telescope, a space photometer launched by NASA in 2009, Johannes Kepler ATV (Automated Transfer Vehicle launched to resupply the ISS in 2011). 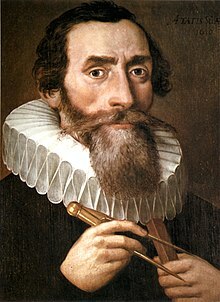 ^ "Kepler's decision to base his causal explanation of planetary motion on a distance-velocity law, rather than on uniform circular motions of compounded spheres, marks a major shift from ancient to modern conceptions of science ... [Kepler] had begun with physical principles and had then derived a trajectory from it, rather than simply constructing new models. In other words, even before discovering the area law, Kepler had abandoned uniform circular motion as a physical principle." (4) However, the credibility of this [argument] is proved by the comparison of the four [moons] of Jupiter and Jupiter with the six planets and the Sun. Because, regarding the body of Jupiter, whether it turns around its axis, we don't have proofs for what suffices for us [regarding the rotation of ] the body of the Earth and especially of the Sun, certainly [as reason proves to us]: but reason attests that, just as it is clearly [true] among the six planets around the Sun, so also it is among the four [moons] of Jupiter, because around the body of Jupiter any [satellite] that can go farther from it orbits slower, and even that [orbit's period] is not in the same proportion, but greater [than the distance from Jupiter]; that is, 3/2 (sescupla ) of the proportion of each of the distances from Jupiter, which is clearly the very [proportion] as [is used for] the six planets above. In his [book] The World of Jupiter [Mundus Jovialis, 1614], [Simon] Mayr [1573–1624] presents these distances, from Jupiter, of the four [moons] of Jupiter: 3, 5, 8, 13 (or 14 [according to] Galileo) ... Mayr presents their time periods: 1 day 18 1/2 hours, 3 days 13 1/3 hours, 7 days 3 hours, 16 days 18 hours: for all [of these data] the proportion is greater than double, thus greater than [the proportion] of the distances 3, 5, 8, 13 or 14, although less than [the proportion] of the squares, which double the proportions of the distances, namely 9, 25, 64, 169 or 196, just as [a power of] 3/2 is also greater than 1 but less than 2. ^ The opening of the movie Mars et Avril by Martin Villeneuve is based on German astronomer Johannes Kepler's cosmological model from the 17th century, Harmonices Mundi, in which the harmony of the universe is determined by the motion of celestial bodies. Benoît Charest also composed the score according to this theory. ^ "Kepler". Random House Webster's Unabridged Dictionary. ^ Dudenredaktion; Kleiner, Stefan; Knöbl, Ralf (2015) [First published 1962]. Das Aussprachewörterbuch [The Pronunciation Dictionary] (in German) (7th ed.). Berlin: Dudenverlag. pp. 487, 505. ISBN 978-3-411-04067-4. ^ Krech, Eva-Maria; Stock, Eberhard; Hirschfeld, Ursula; Anders, Lutz Christian (2009). Deutsches Aussprachewörterbuch [German Pronunciation Dictionary] (in German). Berlin: Walter de Gruyter. pp. 628, 646. ISBN 978-3-11-018202-6. ^ a b Barker, Peter; Goldstein, Bernard R. "Theological Foundations of Kepler's Astronomy", Osiris, 2nd Series, Vol. 16, Science in Theistic Contexts: Cognitive Dimensions (2001), p. 96. ^ Finger, "Origins of Neuroscience," p. 74. Oxford University Press, 2001. ^ Morris Kline, Mathematical Thought from Ancient to Modern Times, p. 299. Oxford University Press, 1972. ^ On motive species, see Lindberg, "The Genesis of Kepler's Theory of Light," pp. 38–40. ^ Koyré, The Astronomical Revolution, pp. 199–202. ^ Peter Barker and Bernard R. Goldstein, "Distance and Velocity in Kepler's Astronomy", Annals of Science, 51 (1994): 59–73, at p. 60. ^ Lodge, O.J., "Johann Kepler" in The World of Mathematics, Vol. 1 (1956) Ed. Newman, J.R., Simon and Schuster, pp. 231. ^ Kepler, Johannes (1966) . Hardie, Colin (ed.). De nive sexangula [The Six-sided Snowflake]. Oxford: Clarendon Press. OCLC 974730. ^ Mazer, Arthur (2010). Shifting the Earth: The Mathematica Quest to Understand the Motion of the Universe. Hoboken, NJ: John Wiley & Sons, Inc. ISBN 978-1-118-02427--0. ^ Miller, Arthur I. (March 24, 2009). Deciphering the cosmic number: the strange friendship of Wolfgang Pauli and Carl Jung. W. W. Norton & Company. p. 80. ISBN 978-0-393-06532-9. Retrieved March 7, 2011. ^ "Johannes Kepler | Biography, Discoveries, & Facts". ^ "Astronomy - the techniques of astronomy". ^ For a detailed study of the reception of Kepler's astronomy see Wilbur Applebaum, "Keplerian Astronomy after Kepler: Researches and Problems," History of Science, 34(1996): 451–504. ^ Helden, Albert van (1976). "The Importance of the Transit of Mercury of 1631". Journal for the History of Astronomy. 7: 1–10. Bibcode:1976JHA.....7....1V. doi:10.1177/002182867600700101. ^ HM Nautical Almanac Office (June 10, 2004). "1631 Transit of Venus". Archived from the original on October 1, 2006. Retrieved August 28, 2006. ^ Lawrence Nolan (ed. ), The Cambridge Descartes Lexicon, Cambridge University Press, 2016, "Inertia." ^ Ulrich Grigull, "Sechzig Jahre Kepler-Kommission", in: Sitzungsberichte der Bayerischen Akademie der Wissenschaften [Sitzung vom 5. Juli 1996], 1996. 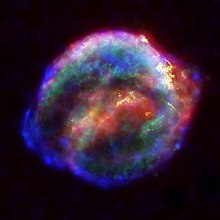 ^ kepler-kommission.de. Ulf Hashagen, Walther von Dyck (1856–1934). Mathematik, Technik und Wissenschaftsorganisation an der TH München, Stuttgart, 2003. ^ Quote from Carl Sagan, Cosmos: A Personal Voyage, episode III: "The Harmony of the Worlds". Kepler was hardly the first to combine physics and astronomy; however, according to the traditional (though disputed) interpretation of the Scientific Revolution, he would be the first astrophysicist in the era of modern science. ^ "Eggenberg Palace coin". Austrian Mint. Archived from the original on May 31, 2011. Retrieved September 9, 2009. ^ "Calendar of the Church Year according to the Episcopal Church". Charles Wohlers. Retrieved October 17, 2014. ^ Ng, Jansen (July 3, 2009). "Kepler Mission Sets Out to Find Planets Using CCD Cameras". DailyTech. Archived from the original on March 10, 2009. Retrieved July 3, 2009. ^ "GJK.cz". GJK.cz. Retrieved October 17, 2014. Liscia, Daniel A. Di. "Johannes Kepler". In Zalta, Edward N. (ed.). Stanford Encyclopedia of Philosophy.